It is with great regret that we inform you that we will suspend our collaboration with "Donna Chiesa Mondo", the monthly magazine of the Osservatore Romano founded by us, born under Benedict XVI seven years ago and always encouraged and supported by you. We throw in the towel because we feel surrounded by a climate of mistrust and progressive delegitimization, by a gaze in which we do not feel the esteem and credit necessary to continue our collaboration. With the closure of "Donna Chiesa Mondo" ends, or rather breaks off, a new and exceptional experience for the Church: for the first time, a group of women who organized themselves independently and voted for their roles and the entrance of new editors, was able to work in the heart of the Vatican and of the communication of the Holy See, free in intelligence and heart, thanks to the consent and support of two popes. Our initiative, as you know, has had and has an uncommon success, with a print edition in Spanish published in Spanish by "Vida Nueva", a more recent edition in French with "La Vie" and an English edition published online. 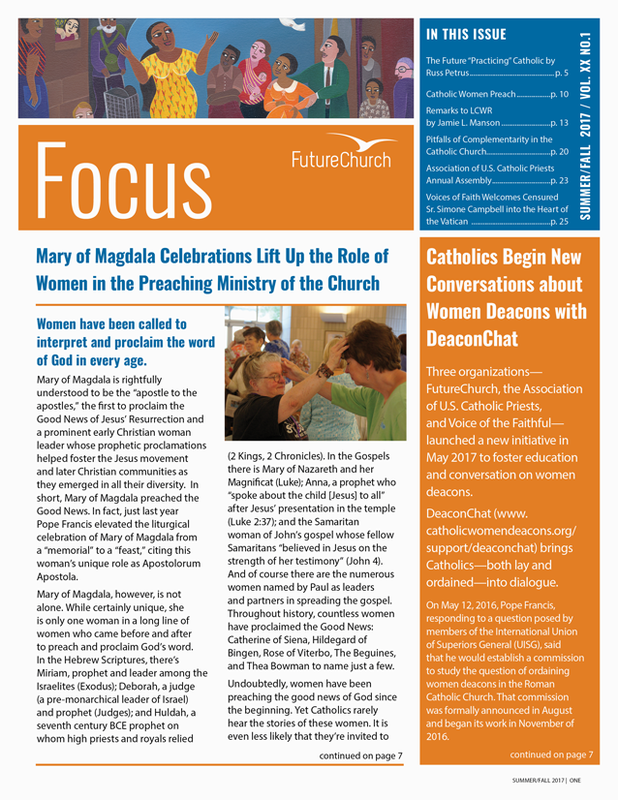 In these seven years, our goal to give a voice to women who, as Church, work in the Church and for the Church, opening up to a dialogue with women of other religions, has come true and has involved thousands of lay people and consecrated women, while confronting itself continuously with the thought and vision of lay people, of consecrated persons, of presbyters and of bishops. The issues addressed were many: from scientific discoveries to political presence; from the enriched re-reading of holy doctors of the Church, such as Teresa of Avila and Hildegard of Bingen, to canon law; from the special feminine qualities that emerged in the proclamation of the Gospel and in the actions of peace-making to the requests of consecrated women in the Church today. In each issue space has been given to meditations on the Gospel texts, edited by the sisters of the monastic community of Bose, and to biblical exegesis by [women] scholars, even non-Catholic ones. From this second line, three books were born: on the women of the Old Testament, on those in the Gospels, and on those of St. Paul, edited by Nuria Calduch Benages and published also in Spanish. Our editorial staff, which met annually for a three-day spiritual retreat at the monastery of Bose, worked as an intellectual and interior laboratory, attentive to listening and welcoming what the readers indicated as a fruitful place and as a research reality, convinced like you that reality is superior to ideologies, to open new avenues of dialogue. And we were ready to walk even unexplored paths. Particularly rich and interesting was the deepening of the relationship with Muslim women, which was accompanied by the rediscovery of a dense female presence in the ancient Islamic tradition, which today is almost ignored. We have often felt like miners discovering precious metal strands and bringing them to the light and to the knowledge of all: a true human and universal wealth, and in this sense "catholic". Of course, among the many letters we have received from readers, including numerous consecrated women, there have also emerged painful cases and experiences that have filled us with indignation and suffering. As you well know, we were not the first to speak, as perhaps we should have, of the serious exploitation to which many consecrated women have been and are subjected (both through subordinate service and through sexual abuse) but we have written about it after the facts had emerged, also thanks to many media outlets. We could no longer remain silent: the trust that so many women had placed in us would have been seriously injured. Now it seems to us that a vital initiative is reduced to silence and that we return to the antiquated and arid custom of choosing from above, under direct male control, women deemed reliable. In this way, a positive work and a beginning of frank and sincere relationship, an occasion of parresia, is discarded in order to return to clerical self-referentiality. Just when this road is denounced by you as infertile. Holy Father, to you and your predecessor we owe the gratitude for these seven years of passionate work which – we are sure of that - has contributed, albeit in small part, to giving feminine conscience, thought and soul to the Church in the world: because indeed, as we read in your apostolic exhortation Evangelii Gaudium (104), women "present the Church with profound and challenging questions which cannot be lightly evaded".